Current trailer series since January 2011 in white on green. The registration consists of two letters, followed by a hologram, the letter R and three numerals. Left of the registration is a blue band with the oval AL in white below the national crest in white. 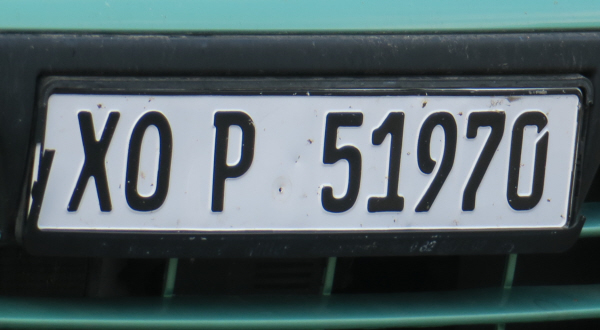 Right of the registration is an optional blue band with an empty circle (could contain the year of registration). Current diplomatic series since 2000 in white on red. The registration consists of the letter C (Diplomatic Corps), followed by four numerals. 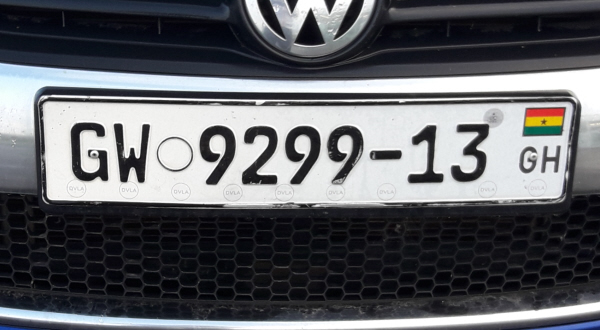 Right of the registration are two smaller numerals, below a horizontal line, denoting the year of validation (2016). 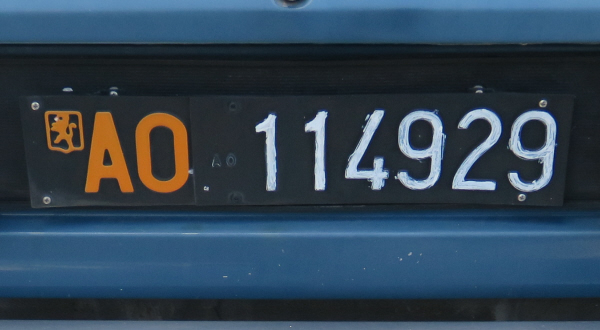 The first two numerals denote the embassy where 11 stands for Belgium. Since 2008 is left of the registration a blue euroband with the oval BG in white below the twelve golden European flags. Current series since 1985 in black on white. The registration consists of two letters, followed by two numerals, a point and another two numerals. After the two letters is a five pointed star in a black shield. 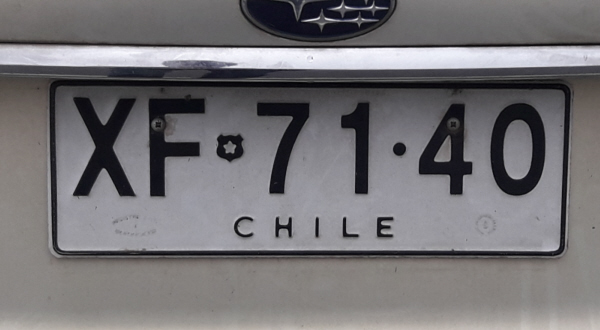 At the bottom of the plate is CHILE in black capitals. Current trailer series since 3rd June 2013 in black on yellow. The registration consists of the letter P, followed by five numerals. To the left is an optional blue euroband with the oval CY in white below the twelve golden European stars. Current motorcycle series in black on white since 7th April 2009. The registration consists of two numerals above three letters. Top left is a blue euroband with the letters FIN in white capitals below the twelve golden European stars. Current passenger series since 15th April 2009 in black on white. The registration consists of two letters, followed by a hyphen, three numerals, a hyphen and two letters. Left of the registration is a blue band with the oval F in white below the twelve golden European stars. 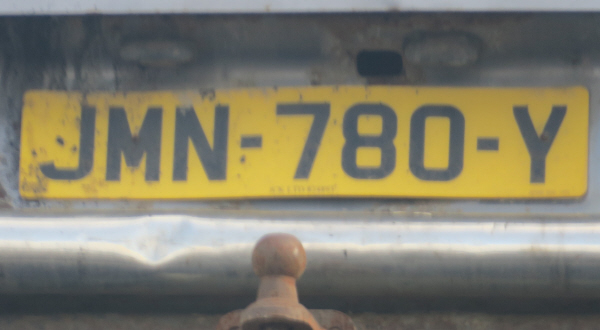 Right of the registration is a blue band with the regional logo (Rhône-Alpes) above the department code where 987 stands for French Polynesia. Current passenger series since 1995 in black on white. The registration consists of two letters, followed by a hyphen, four numerals, a hyphen and two numerals. 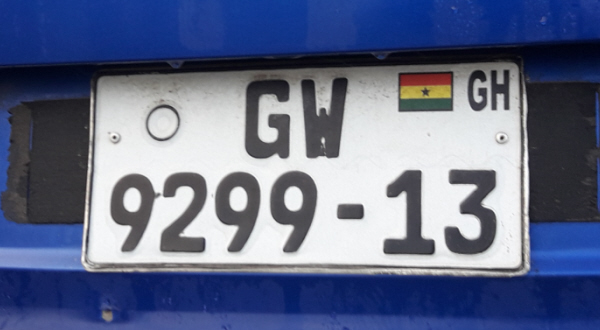 The first two letters denote the region where GW stands for Greater Accra. Since 2009 the last two numerals denote the year where 13 stands for 2013. Right of the registeration is the national flag above GH. 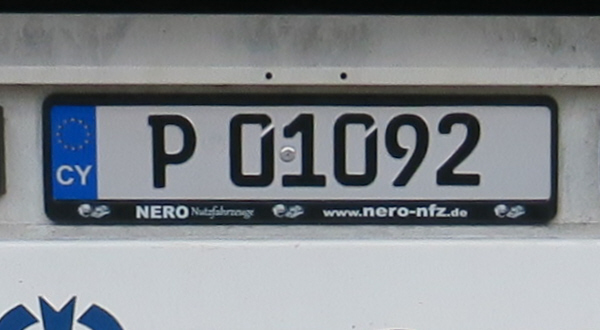 Current passenger series since 1995, two-line plate in black on white. The registration consists of two letters above four numerals, a hyphen and two numerals. Top right of the registeration is the national flag above GH. Current passenger series since June 2007 in blue on white. The registration consists of two letters, followed by one letter and two numerals. 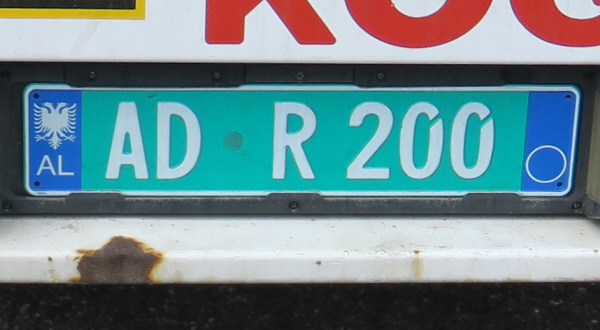 In the middle of the plate is an inspection sticker indicating the year of validity (2018). 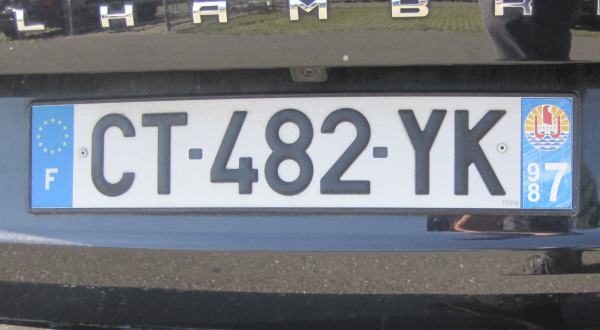 Left of the plate is the Icelandic flag above the oval IS as part of the registration. 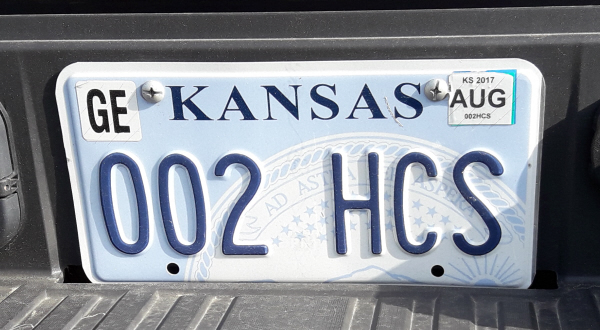 Current trade plate since 2004 in black on white. The registration consists of two letters, followed by the letter P and five numerals. 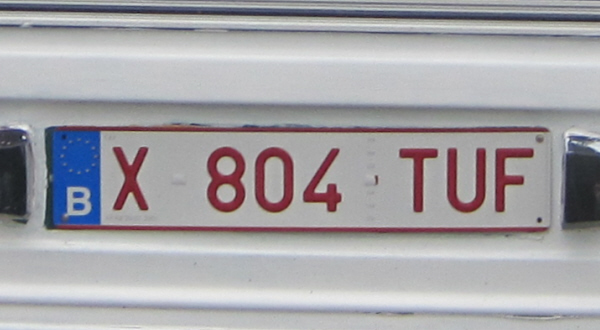 Former passenger series issued between 1994 and 1999, rear plate in black on white. The registration consists of two letters, followed by three numerals and two letters. After the first two letters is the republic seal. 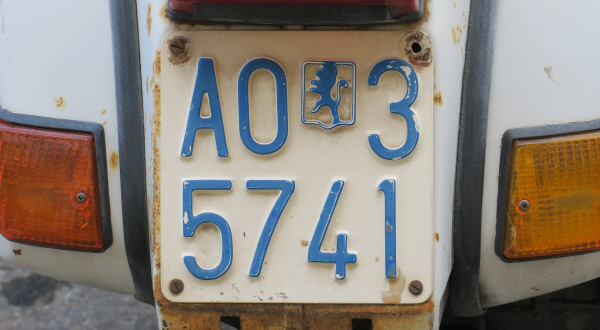 Before the last two letters is for Aosta plates optionally also the provincial crest. Former passenger series issued between 1932 and 1985, smaller size front plate in white on black. The registration consists of six numerals, followed by two letters. The last two letters denote the province where AO stands for Aosta. 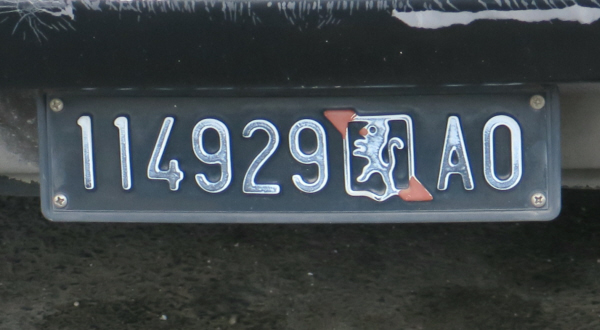 Before the province code is for Aosta plates optionally also the provincial crest. Former passenger series issued between 1932 and 1985, rear plate in white on black. 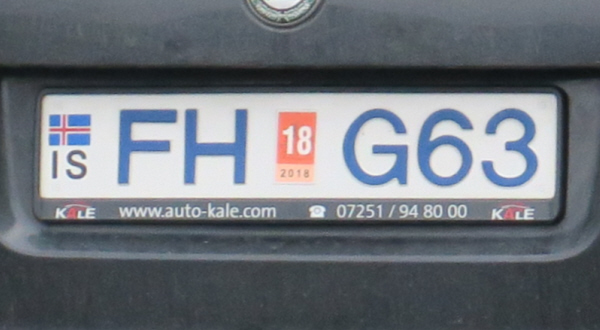 The registration consists of two letters in orange since 1976, followed by six numerals. The first two letters denote the province where AO stands for Aosta. After the province code is the republic seal below a very small provincial code (BA). 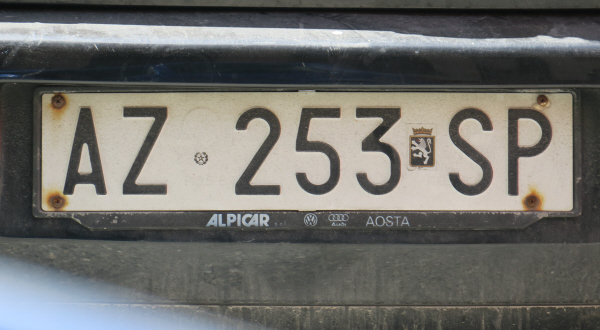 Left of the registration is for Aosta plates optionally also the provincial crest. Former motorcycle series issued between 1959 and 1985 in blue on white. The registration consists of two letters, followed by one numeral above four numerals. After the province code is for Aosta plates optionally also the provincial crest. Current Italian Red Cross trailer series since 1911 in black on white. The registration consists of the letters CRI in red, followed by one letter, three numerals and one letter. This combination was issued between 2003 and in 2008. 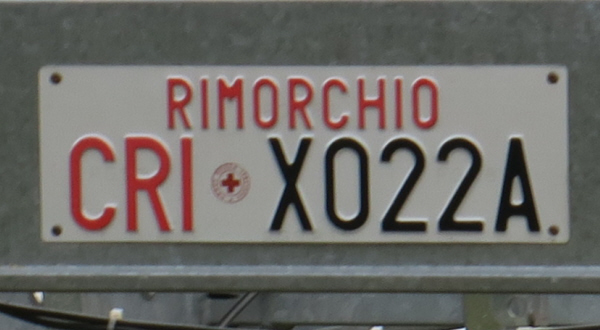 At the top of the plate is RIMORCHIO (trailer) in red capitals. After the letters CRI is a red encircled cross. 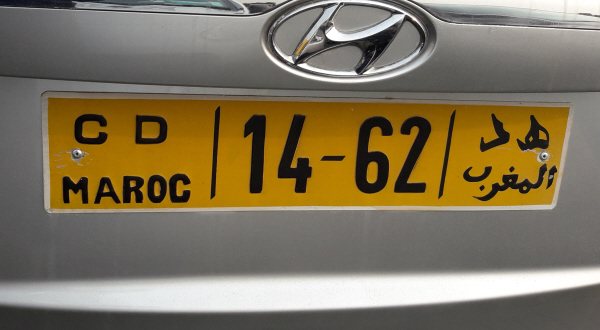 Current passenger series since November 1994, rear plate in black on yellow. The registration consists of one letter, followed by MN, a hyphen, three numerals, a hyphen and one letter. 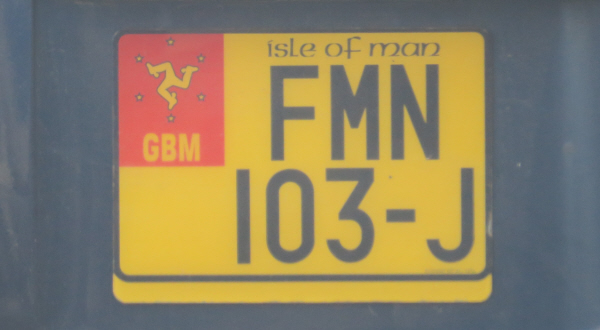 Note that this plate has no red band nor the name of the island is not at the top of the plate (optional and legal). The registration consists of one letter, followed by MN, above three numerals, a hyphen and one letter. At the top of the plate is Isle of Man in black. 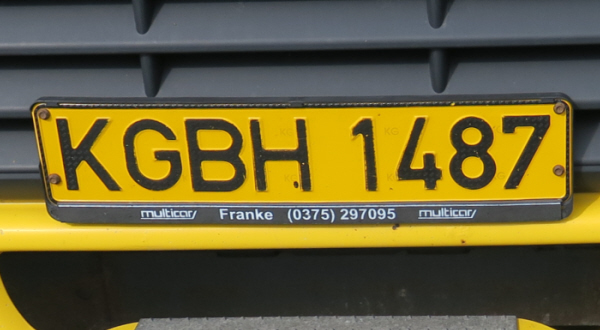 Top left of the registration is a red band with the letters GBM in white capitals below the "Legs of Man" within 6 yellow stars. Current trailer series since December 2012 in black on white with a black border, only using western letters. The registration consists of three smaller letters above two large numerals. 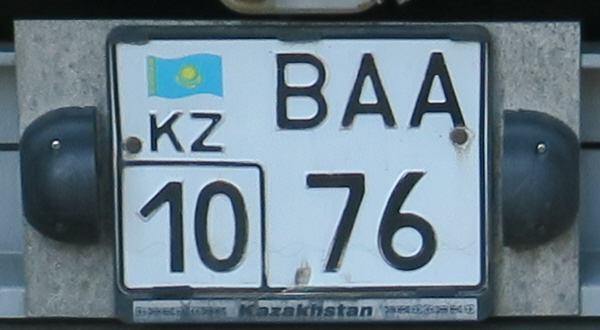 Top left of the registration is the national flag above the oval KZ in black capitals. Bottom left is a separate panel with a number indicating the town or province, where 10 stands for Qostanay (Kustanay). Current passenger series since 6th December 2010 in black on white. The registration consists of two numerals, followed the state logo, three letters, a hyphen and two numerals. 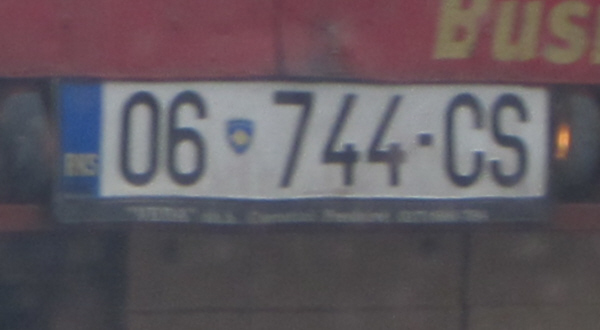 The first two numerals denote region the where 06 stands for Gjilan. Left of the registration is a blue band with the letters RKS in yellow capitals. 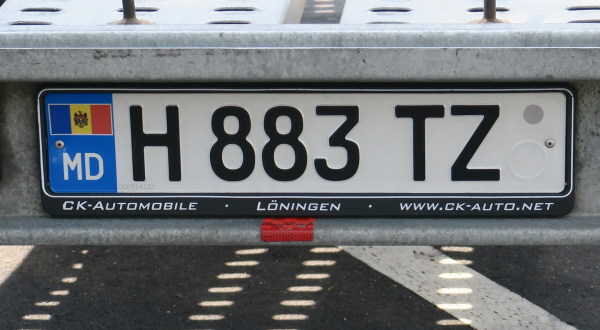 Former trailer series issued between since 2007 and 1 June 2016 in black on white. The registration consists of three numerals above two letters. The first letter denotes the district where B stands for Bishkek city. 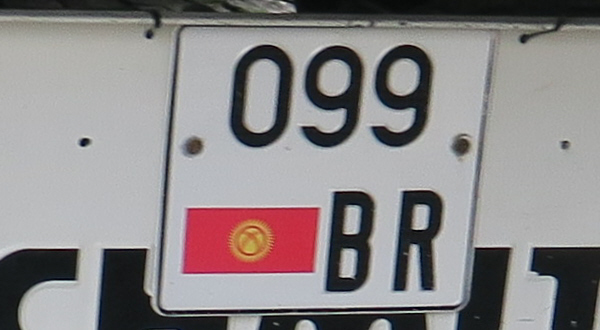 Bottom left of the registration is a red band with the republic's symbol of a yellow yurt surrounded by flames of the sun. Former foreigners not of diplomatic status series issued between 2003 and 1 June 2016 in black on yellow. The registration consists of four letters, followed by four numerals. The first two letters are KG, the third letter is the province or city code where B stands for Bishkek city. The fourth letter indicated the type where H stands for residents. Current trailer series since 1st April 2015 in black on white with a black border. The registration consists of one letter, followed by three numerals and two letters. Left of the registration is a blue band the national crest above the oval MD in white. 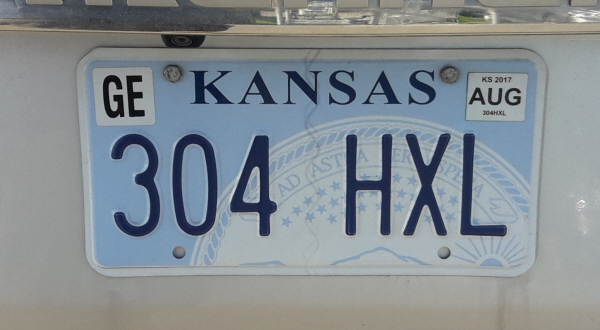 Right of the plate is a hologram with a security number and an embossed area for placement of a technical inspection sticker. Current diplomatic (CD) series since 2000 in black on yellow. The registration is in a central panel and consists of two numerals, followed by a hyphen and two numerals. To left of the plate is CD above Maroc in black. To the right is the same in Arabic writing. The last two numerals indicate the embassy where 62 is an unknown code. 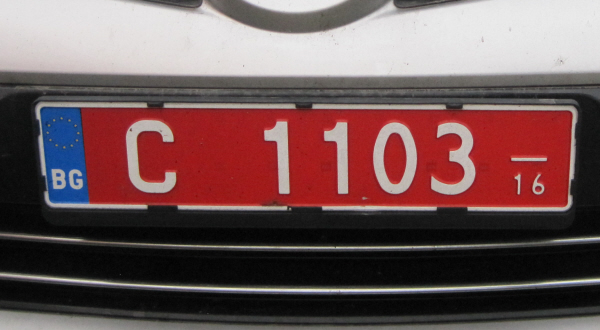 Former passenger series issued between 1st August 1983 and 31st August 2001, illegally remade as a Belgian plate in red on white. The registration consists of one letter, followed by three numerals and three letters. The first letter denotes the period of issue, where X is used for 6 months starting from 1st September 2000. The last two letters denote the issuing office where UF stands for Brighton. 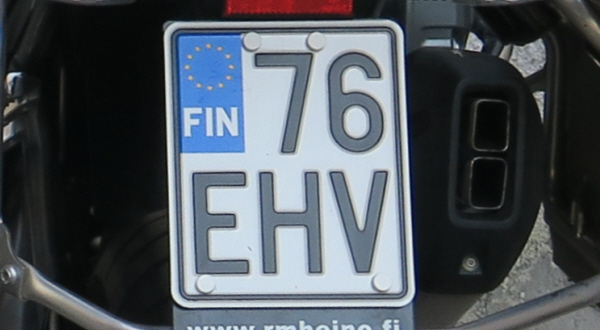 Left of the plate is a blue band with the oval B in white below the twelve golden European stars. Current passenger series since 1968 in gold on black. The registration consists of five numerals. 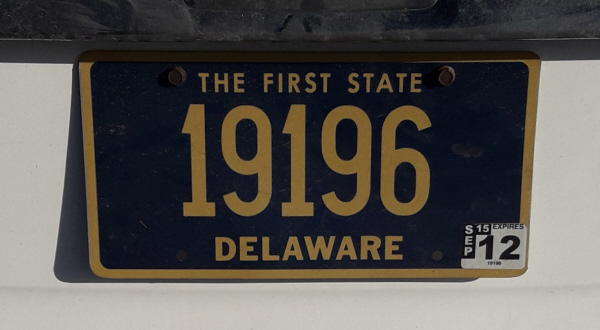 At the top of the plate is THE FIRST STATE in gold capitals and at the bottom is DELAWARE in gold capitals. Bottom right of the plate is a revalidation sticker. Current passenger series since April 2007 in black on blue. The registration consists of three numerals, followed by three letters. On top of the plate is KANSAS in black. The background shows a portion of the state seal against a blue ground. Top left is a sticker with two letters denoting the county, where GE stands for Geary. Top right is a month and year validation sticker. Special series since 1998 in blue on white. The registration consists of the letters CF, CX or CY, followed by four numerals. At the top of the plate is VIRGINIA in blue capitals. 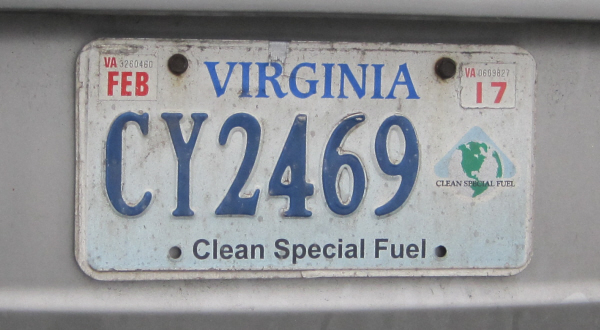 Right of the registration is a crest with the slogan CLEAN SPECIAL FUEL in black capitals. At the bottom of the registration is the slogan Clean Special Fuel in black capitals. In the top corners are month and year revalidation stickers (February 2017).